Opti-Print™ Maps. 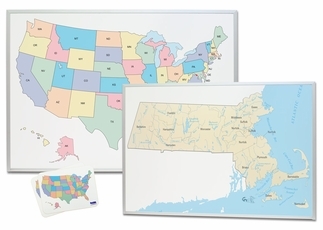 Custom printed dry erase maps in a standard, non-magnetic and magnetic receptive format. 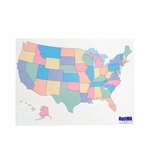 We've made custom dry erase maps for every branch of the military, school and college campuses, safety response teams, municipalities, businesses and so many more. All of the custom printed maps we have created have been in digital quality. The colors are outrageous and so is the detail. We have a large assortment of sizes available. Each board comes with or without a full-length marker tray, sturdy satin anodized aluminum trims and installation hardware. Stock boards all have full-length marker trays. Contact one of our Graphics Specialist toll free at 877-393-0111 within the continental U.S. or 508-842-6200 outside of the continental U.S.
All we need to get started is for you to send us a high resolution image, preferably a vector file because a vector file or image is completely scalable. There is a small one-time artwork set up fee for each image that you wish to use. We'll keep your artwork on file for up to a year so that if you decide you need more boards there's no additional fees. 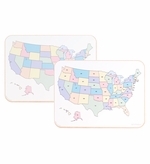 From "Options" "MA: Non-Magnetic (+$129.95)" "HB: Magnetic Receptive (+$199.95)"
Blank 30" x 42" USA Map Magnet. Sticks to any magnetic whiteboard or chalkboard.